View More In Money Banks. 2.Green lights on, then rotate the knob clockwise to open the door. Note:If you enter the wrong passwords, the red light will be illuminated,and remind you "please try again". 1.Enter the current password (default 0000) to open the door of the safe.Long press "*" button, green light and red flashing. 2.Input 4 new passwords in 15 seconds, according to the "#" confirm new password storage. Two lights stop flashing. 3.If the new password is not entered in 15 seconds, the program will stop and the program must be restarted.Release the "*" button and close the door. Note:If you forget your password,you can remove the battery, and Install the battery after 5 minutes, the password returns to the original code: 0000,then you can reset your password again. 2.Do not mix the use of new and old batteries. 3.If you don't use it for a few weeks, remove the battery. Our products are well tested before delivery,please feel confortable to buy, if you have any questions,Please contact the seller for assistance,we'll help you at once. Automatic Roll Money: Put the paper money on the scroll, it can be rolled into the Piggy Bank automatically. (But please notice it doesn't work if the paper is too old or too soft). High-capacity: Can store 600 pieces of coins or 100 pieces of paper money. interesting & funny, a must item for child or gifts, greatly help your child to develop a good habit of saving money. Environmental protection materials: It use environmental ABS plastic, No odor, anti-aging, durable, adults and kids all can use it, large capacity, Size: L*W*H: 13.5*12.5*19.5cm Product net weight: 0.56kg Power by Battery: 3 AA batteries (Not Included), Can help adults hold some private small items. Improve the Child's Property safety Consciousness: It can be used to store toys, jewelry, baseball cards, etc. 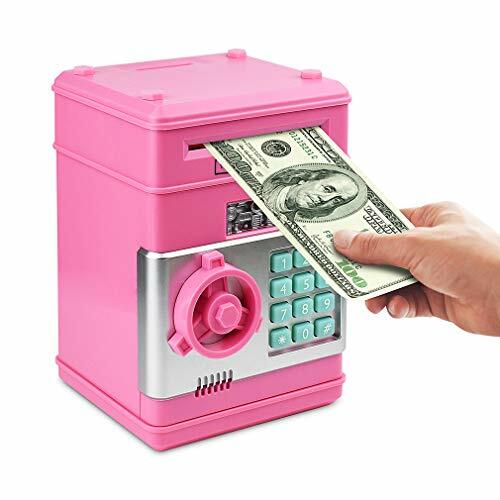 insert coins into the top of the money bank and you insert bills into the side，just use the safe as a piggy bank. If you have any questions about this product by Satevin, contact us by completing and submitting the form below. If you are looking for a specif part number, please include it with your message.